The STRONGBACK24 is the first off-the-shelf standard folding manual wheelchair to provide frame-integrated effective posture support. Its unique shape promotes healthy upright sitting and ensures comfort from the first moment. The STRONGBACK24 is as convenient, easy, and simple to operate as conventional wheelchairs. In addition to the outstanding ergonomics, the STRONGBACK24 also impresses with stylishly curved lines and its elegant yet sporty color scheme. 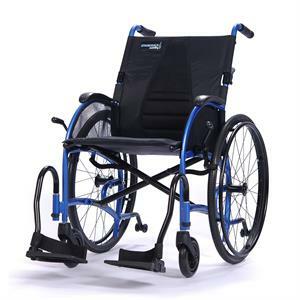 It exhibits all of the benefits expected in an ultra-lightweight wheelchair - it is easily foldable, simple to use, and highly portable. Size (unfolded): 40" x 27" x 37"
Size (folded): 29" x 14" x 29.5"
Weight without rear wheels, footrests, & anti-tip levers 13.8 lbs.